Despite it’s rather unfitting name, you shouldn’t underestimate the new ZigZag777 Casino. 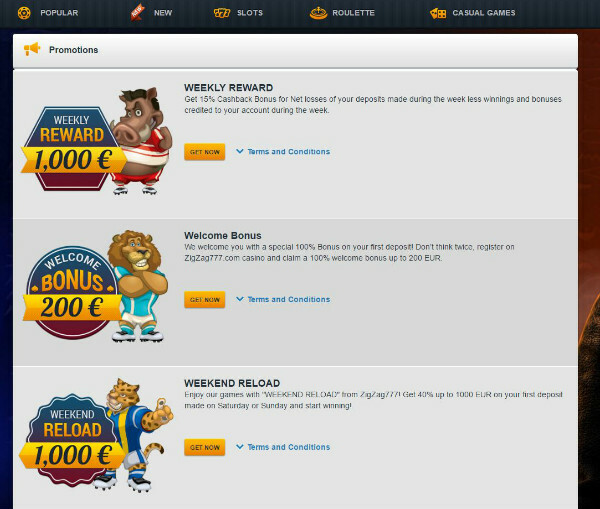 This new online gambling destination is equiped with a rather large kit of great casino games and is available in English, Russian, Swedish and Polish. A new player to the market that will soon be a true force to reckon with. Launched in 2016, ZigZag777 Casino offers a colourful and fun-filled online gambling experience. This fresh-faced casino is owned and operated by Joc Solutions Limited and licensed by Curacao eGaming, while its parent company is based in Gibraltar. 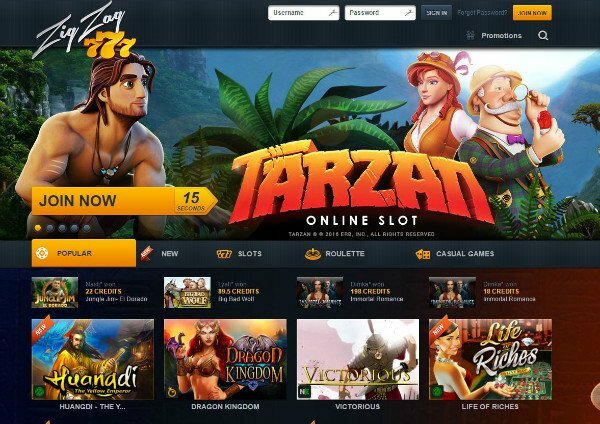 ZigZag777 prides itself on offering an exciting new approach to online gaming, with a seemingly endless number of online casino games, with video slots leading the pack. However, that does not mean other casino games are not covered, and players will enjoy a host of classic games like Roulette and Blackjack as well as arcade games, all packed with excitement, thrills and plenty of winning opportunities. In fact, the casino is home to over 200 casino games, which is very impressive since the casino just launched a few months ago. This site also reaches players on a global scale and is available in English, Russian, Polish and Swedish. Fairness, transparency and trust go a long way at ZigZag777 Online Casino, and the site is dedicated to offering players the safest and most secure online gaming experience. That being said, the casino makes use of the Random Number Generator software to ensure game results are completely random. This software is used by some of the most established casinos in the industry and adds a sense of security knowing that your gameplay is fair and the results are completely arbitrary. The site also uses the latest SSL encryption technology to keep all personal data protected at all times. This technology is so sophisticated that some of the leading financial institutions in the world use it. ZigZag777 is an instant play casino, which means you may access the site directly from your web browser without the need to download any software. This makes everything so much more convenient as all you need to start playing is a stable internet connection. Additionally, the casino runs a mobile-friendly site that allows players on the move to enjoy a nice variety of online casino games anytime, anywhere, while on the move. All mobile-friendly games have been adapted to pay seamlessly on your Android or iOS mobile device, ensuring a high-quality gaming experience for all players. From now on, you can benefit of the absolutely Free Download version of ZigZag777 (argocasino) for Mac, Win Line and Android. ZigZag777 Casino Games are powered by multiple software providers, offering players a diverse selection of games from which to choose. NetEnt and Microgaming lead the pack at this casino, and you will find a host of your favourite titles featured on the site. These are two software platforms that know how to attract and appeal to players, so expect cutting edge visual and sound effects coupled with smooth and seamless gameplay. Each game, particularly the slot machines, features unique and entertaining themes that will appeal every taste. Some of the most popular online slot titles include Mötorhead, Starburst, Gonzo's Quest, Green Lantern, Batman, Guns 'n Roses and Jungle Jim. Interestingly enough, the casino seems to focus strongly on roulette games and features 18 different variations of this game. Roulette players will therefore be spoilt for choice as you browse through the selection, with each version being more exciting and rewarding as the one before. Other table games like Blackjack and Baccarat is also featured, although not as prominently, while there is also a decent selection of video poker and casual games. The casino's promotion section, while not large, does offer the most common promotions, including the quintessential welcome bonus, as well as weekly rewards and reload bonuses. As is common with online casinos, ZigZag777 offers new players more than enough reason to join the site with a 100% match bonus up to £200 on your first deposit. This bonus is only applicable to newcomers joining the site for the first time, and you must make a minimum deposit of £10 to be eligible to claim this reward. Also, you must meet the wagering requirement of 40x the initial bonus unless otherwise stated. The Weekly Reward bonus is ideal for high rollers who like to play big. Here you can earn a 15% cash back reward on all of your net losses for one week. Players can receive up to £1,000 in cashback, which must be claimed and used within 14 days. This bonus is also only applicable if you meet the minimum wagering requirement of 40x your initial bonus. The Weekend Bonus guarantees a winning end to the week with a 40% match on a deposit of up to £1 000 on transfers made on Saturdays and Sundays. The same conditions apply as with the previous bonuses, and it is advised that players check out the individual terms and conditions per promotion before participating. Should you come across any questions, issues or concerns, a dedicated support team will be at your beck and call 24/7 to offer assistance. While English is the main language, support is also available in Russian and Polish for your convenience. You can quickly and easily contact an agent via the live chat feature available on the site, which can be used without interrupting your gameplay. Response time is usually fast and efficient, while an extensive FAQ section covers some of the most common casino-related queries. Additionally, you make also email support@zigzag777.com if you prefer this method of correspondence. The ZigZag 777 בשדןמם banking options are impressive, to say the least, and feature a host of options from which to choose. You may use your credit or debit card, e-wallets as well as make use of bank transfers while playing at this online casino. As usual, MasterCard and Visa are readily accepted, while the casino also accepts Skrill, Neteller, Euteller, TrustPay, Postepay, Maestro, PaysafeCard, Sofort and Giropay. As far as themes go, zigzag777.com seems dedicated to offering a fun-filled and entertaining online gaming experience. The site doesn't exhibit any signs of trying too hard and looks to be a casino that wants players to have a good time. The homepage is lively, featuring an exciting array of promotional offers and games all proudly displayed for the world to see. But while the homepage may seem overly populated, it is not overwhelming, and navigation is a breeze. The site has been designed to be functional and user-friendly while still capturing the eye of players thanks to bold colours and bright graphics. 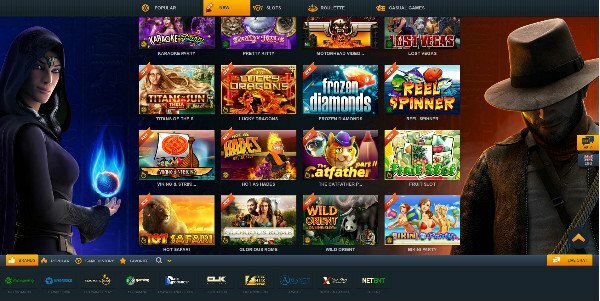 ZigZag777 appeared on the online gambling scene just a few short months ago and is already showing signs of serious potential. There are definitely some improvements that can be made, especially in terms of the promotions section, which we feel could be juiced up a little. But other than that, the casino has already made its mark in the industry thanks to a remarkably simple and user-friendly interface, an attractive look and feel, a solid games selection and top-notch security. ZigZag777 is the place to be if you are looking for a new and exciting gambling destination to sink your teeth into.